How many of you are into vegetarian meals? I’m definitely not one as I love meat. Having tried most of the famous healthy meal deliveries in town, I did something different. I went on the gigantic meal delivery portal FoodPanda and decided to order a healthy meal. I clicked on the “healthy options” and was expecting to have more choices as it looked like there was a wide array of meals in there. To my dismay, it only showed three and it excluded Salad Bar and Chai Bar which were both so close to where I live. I’m pretty sure there are healthier options from other restaurants too, like Chili’s or Italiannies. So I had to search manually for those restaurants and order from there, if I wanted to. 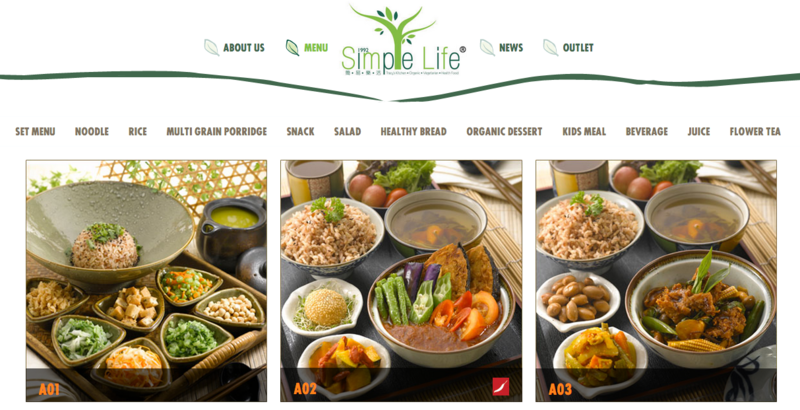 But, in the end, I decided to go with Simple Life Healthy Vegetarian Restaurant. Speaking about getting out of my comfort zone, eh? I love understanding the philosophy behind a restaurant or service so I took a look at their website and here are their 4 core principles that they stand up for: High in fiber. Low in sugar. Low in salt. Low in oil. They also shared that their concept of eating healthy is to have no MSG, no trans-fat, no colouring and no preservatives. 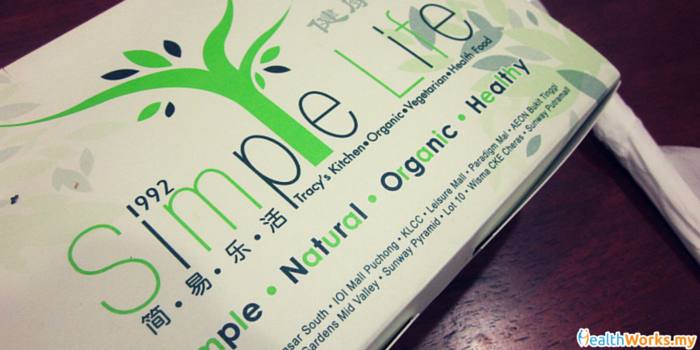 Simple Life also advocates for organic produce, although I’m not too sure if organic is really healthier than regularly grown crops, to be honest. 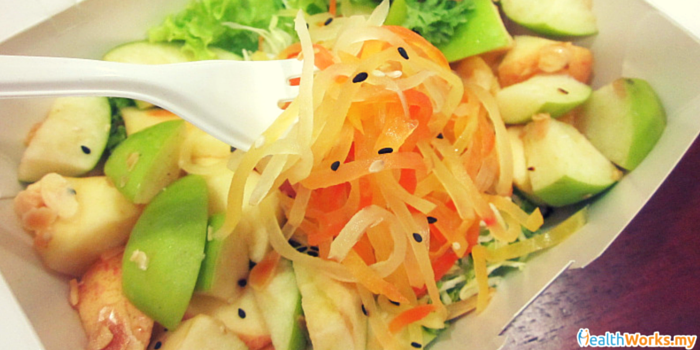 What’s in the box: Chilled green apple and fuji apple with pickled veggies and lettuce sprinkled with sesame seeds and almond chips. Taste: Apples were fresh, crunchy and sweet. Went well with the tart pickled veggies. Verdict: Cubed apples make eating apples less of a chore and before you know it, you have just munched on 2 servings of fruits for the day! The salad can be kept in the fridge to eat as a snack later in the day if you can’t finish it in one sitting. All in all, nothing super special for RM13.90. It’s a pretty simple salad you could prep yourself with a bit of time. What’s in the box: 3 pieces of white bread, lettuce, tomatoes, vegetarian ham, cheese and mayo. Served with fried mushrooms. 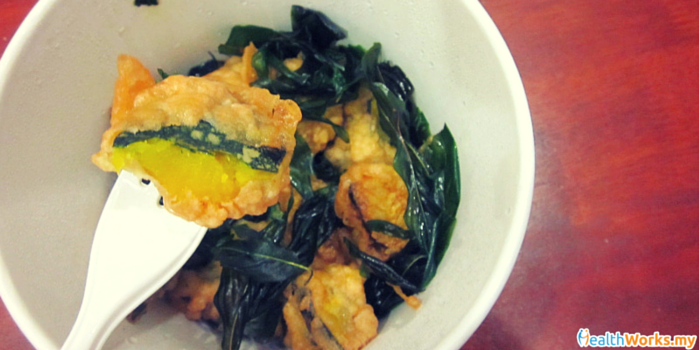 Taste: Fried mushrooms were a tad oily. The rest was pretty tasty and filling. 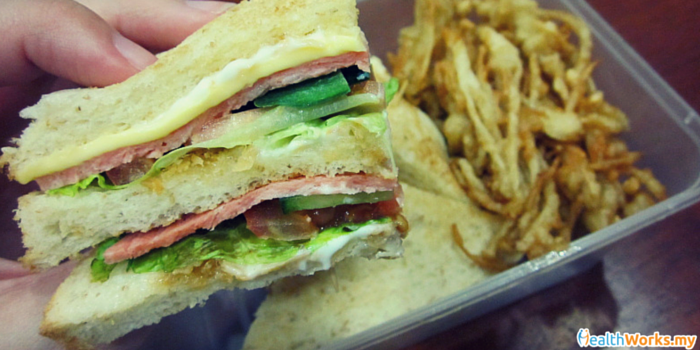 I think club sandwiches usually won’t taste bad unless they are served with weird spreads or veggies that are not fresh. Verdict: I was a little bit upset because I ordered charcoal bread and got white bread instead. It turns out that this wasn’t an isolated incident as other reviews on FoodPanda also highlighted this problem. It’s creative of them to serve mushrooms as a healthier alternative to the usual french fries or chips served with sandwiches. But perhaps they could do a better job at it by baking the mushrooms instead of deep-frying them as oil oozed out whenever I took a bite. I know some people might be freaking out whenever we talk about mayo. If you’re just having this once in a while, it shouldn’t be a huge problem. Mayo provides fat and sodium. 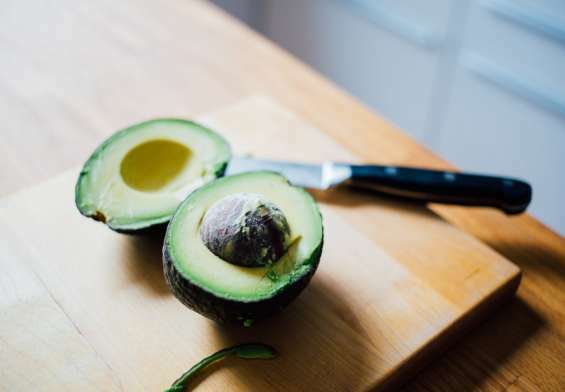 Let’s remember that our bodies do need those too and one tablespoon of regular mayo may help provide 8% of your fat intake and 4% of your sodium intake (based on a 2,000 calorie diet). 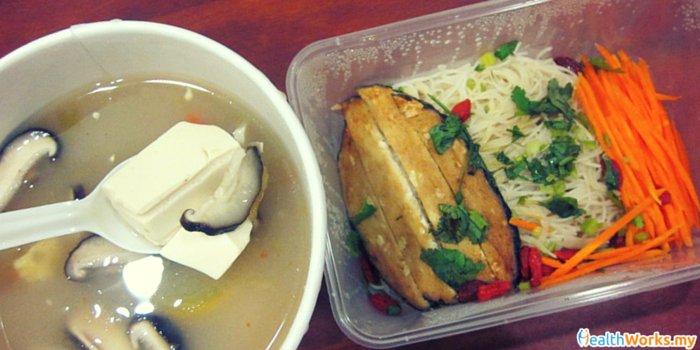 What’s in the box: Brown rice bee hoon served with carrot strips, goji berries, vegetarian fish, tofu and mushroom strips in a bowl of hot sour spicy soup. Taste: Light, simple and of course, spicy. A warm hearty meal with fresh ingredients. The goji berries were a sweet and nutritious addition while the beehoon was deliciously al dente. The natural sourish taste from the tomatoes and vinegar in the soup was very appetising. Verdict: This was a great choice, my mother loved it too! Protein-packed tofu and mushrooms made good alternatives when you do not have your meat. 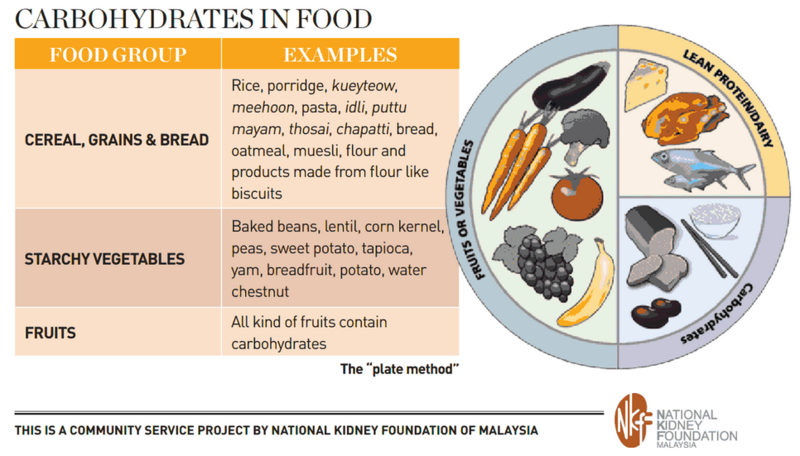 I personally viewed this as a well-balanced nutritious meal for a vegetarian dish, and the cooking method was also healthy as most are steamed or boiled. Taste: The pumpkin tasted all right. It was soft and sweet. The coated batter added a little saltiness to each bite. Sadly, it wasn’t as crispy as its name claimed to be. I guessed the delivery process made it soggy as the steam started to condense in the package. Verdict: I was pretty confused with this dish. I thought one of their philosophies was for their food to be “low in oil”. But it tasted like it was deep fried in a vat of oil, not baked or pan-fried. I could be wrong. Nevertheless, pumpkin is no doubt a better option compared to potato wedges. It’s higher in fiber and has lower calories. The portion size for this dish was decent for its price. Taste: Longan was chewy with each bite and the coral seaweed was pretty tender, not stiff. They must have soaked them right! Great dessert to end the meal with a decent touch of sweetness that came naturally from the coral seaweed. Verdict: Longan provides a good dose of vitamin C and coral seaweed is rich in minerals. Definitely a good choice for dessert! Simple Life does a pretty good vegetarian twist on regular Chinese dishes and I enjoy their Asian dishes more than their Western counterparts. I’d suggest picking their set meals as those look more nutritious and filled with variety. You can order via FoodPanda via their website, Android App or iOS App. Disclaimer: All meals were provided by FoodPanda. You’re very much welcomed! Drop us a message once you have delivery options, definitely would love to share it with the community!